Electric utility companies are putting considerable emphasis on creating and maintaining accurate asset records. Geographic Information Systems (GIS) provide the ideal solution for integrating location and associated attribute data for electric transmission assets. XP-RS employs airborne remote sensing technologies to acquire the core data that is neccesary for creating or updating GIS databases. While there is no standard product most projects require positional information to be derived from rectified aerial photography, and this imagery will also serve as part of the land-base for the right-of-way. High resolution digital structure photographs provide a detailed record of each asset at the moment-in-time of the survey and also serve to provide much of the attribute data that is to be recorded for each structure. In order to provide a clear view of the right-of-way, digital video can be recorded during helicopter acquistion flights. 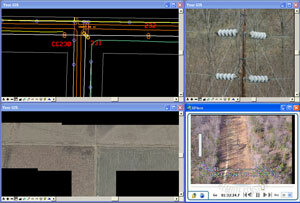 Digital video can be used to provide a heads-up view of a transmission asset or right-of-way feature. Cross referencing video to orthophotos provides an accurate location and can often eliminate the man-hours and cost associated with sending peronnel into the field. XP-RS has years of experience in integrating digital imagery, digital video, mapping amd asset-specific data into GIS. With our experience comes the ability to advise on data storage strategies, imagery specifications and the ability to provide add-on software tools that provide easy access to large data sets. XP-RS is experienced in providing data and developing tools for GIS environments such as ESRI, and GE SmallWorld. Contact us directly to discuss your GIS project requirements. GIS data is created in layers which are composed of vector and raster information. XP-RS supplements its GIS location data with georeferenced photos and videos. XPlore is part of the XP-RS image viewing suite of tools that simplifies the task of using its geospatial imagery and data.